Gary Hauk, vice president and deputy to the president, will also serve as university historian. Emory Photo/Video. Gary Hauk, vice president and deputy to the president, and author or editor of four books of Emory history, has been appointed as the university's first official historian, a role that he has filled unofficially for many years. The new position will occupy a portion of his time, while he will continue to serve as deputy to the president. 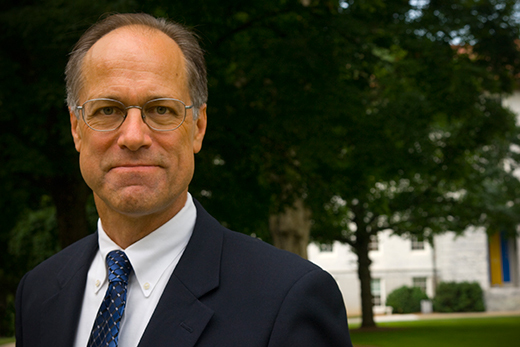 In making the appointment, President James Wagner and University Librarian Yolanda Cooper commented that Hauk's role will be "to advance actively an awareness of and appreciation for the richness of the institution's past as well as for the trajectory that the past has set for Emory's future." Wagner noted that a number of eminent universities and colleges have designated such an office as a way to foster a deeper sense of institutional character and tradition. As a go-to person for questions about Emory's history for many years, Hauk fields frequent emails and phone calls from students, staff, alumni and others who want to know more about Emory's unusual development and the people and events that have made for a fascinating story. "I've enjoyed nurturing the campus community's engagement with Emory's past as well as responding to questions from the broader public," Hauk says. "If I don't know the answer I usually know where to find it." In addition to authoring two books, "A Legacy of Heart and Mind" and "Religion and Reason Joined: Candler at One Hundred," Hauk is the co-editor with Sally Wolff King of a collection of essays on Emory history, "Where Courageous Inquiry Leads," and the editor of Clyde Partin Sr.'s "Athletics for All," a history of athletics at Emory. He initiated and chairs the Traditions and History Committee, which guided the university's observance of its 175th anniversary in 2011, and he launched the university's first history website, emoryhistory.emory.edu. As university historian he will be formally associated with the Stuart A. Rose Manuscript, Archives, and Rare Book Library, home of the university's extensive archives and special collections. "Gary has inspired those of us in the Rose Library with his dedication to narrating the history of Emory," Magee says. "Now, with the official recognition of this role, we will be honored to work even more closely with him and to engage with him on topics of deep interest to the entire Emory community." "We have a superb archival collection, thanks to the vision of former Special Collections director Linda Matthews and our first university archivist, Ginger Smith," Hauk says. "The staff in the Rose Library is wonderful to work with, so I am looking forward to spending more time with new colleagues and old documents." Hauk is committed to teaching at least one course on Emory history in Emory College, and two projects will focus Hauk's attention immediately. The first is creation of a daily blog on Emory history. "Our archivists have beautifully made a lot of material available online, so I want to augment that digital resource with more images and context." Looming larger is the work of researching and writing a thorough history of Emory from its founding to the completion of the current strategic plan. "A lot has happened at Emory in the 15 years since 'A Legacy of Heart and Mind' was published, and I've learned far more about Emory thanks to the good work of others digging into Emory's past. To quote Emory's eighth president, Atticus Haygood—'I have got new light. I hope to have more new light!'"